This article will help you avoid wasting money on a handgun safe that looks secure, but can be opened with paperclips, coat hangers, or just banging them (videos below). Scroll down to skip ahead to recommended handgun safe models. The locks are the worst part of most small gun safes. Most pistol safes have cheap, unrated locks which can be compromised easily (videos below). “Unrated” means that the lock has not been independently verified by Underwriters Laboratories (UL), who performs the industry-standard tests for safe locks. 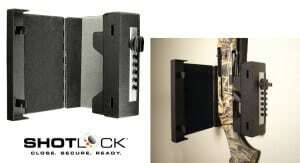 The “locks” on most cheap electronic handgun safes is a battery-powered latch, similar to the latch on a screen door. Like a screen door, a spring loaded plunger protrudes to the door latch. This can be directly as shown in the illustration, or through a mechanism. Entering the combination on the keypad energizes a solenoid coil or motor to retract the latch plunger. The mechanisms vary, but these models have one thing in common. 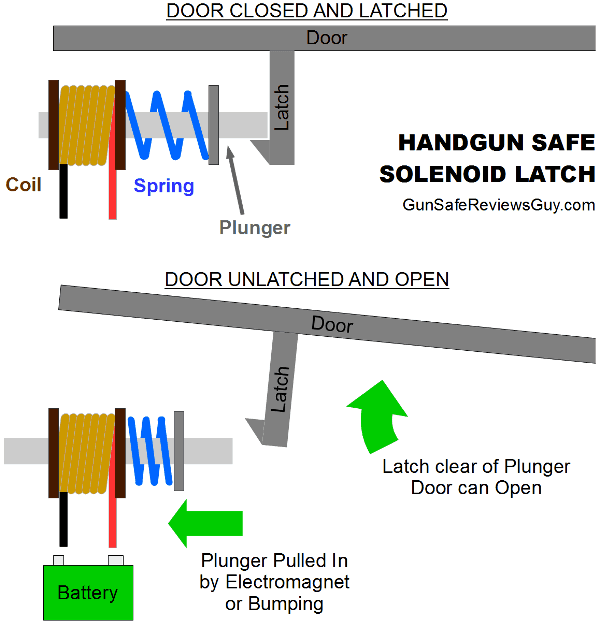 When no electricity is applied, the only thing holding the latch plunger locked, and the safe locked, is a small spring. On solenoid latches especially, this spring must be weak to allow a battery-powered magnet to overcome the spring without draining the battery too quickly. There is a direct trade-off between the strength of the spring and battery life of the “lock”. Simply bumping the worst of these gun safes can overcome the spring holding the plunger, opening the door. UL rated safe locks cannot be bumped in this way. Safe experts at UL test for this type of obvious design flaw before approving them. UL 768 rated electronic locks generally use a motor with a reduction gearbox to actuate a deadbolt, making them more expensive than small-gun-safe latch-“locks”. Another issue with spring latches is that they can be unlatched by poking various areas of the mechanism. You can see this in the videos above and below, and many others on the internet. Most homeowners insist on deadbolt exterior locks in addition to traditional latching door handles. If you require a deadbolt on your exterior doors, you probably want one on your handgun safe, too. The vast majority of small electronic handgun safes have too many holes in their steel exterior. Many holes appear to be covered, but are easy to access by peeling up or popping off exterior pieces. Holes are included for routing wires, attaching plastic parts, for audio (beeps), security cable slots, where un-welded metal seams come together, etc.. Regardless of why they’re there, holes are a liability to electronic handgun safe latches. Any holes can be used to poke inside to the latching mechanism or electronics, as shown in these videos. The worst part, is that this type of tampering will usually open the safe without indication it was opened, or any permanent damage. Most electronic handgun safes have an electronic combination reset button inside. After pushing the reset button, typing in any keypad code will open the handgun safe. The buttons can often be reached through a hole, or by prying open the door a little bit. If the reset button can be poked, the door will open, as shown below. This type of attack permanently changes the combination, so it is detectable after the fact. But, by then, the “safe” was already opened. A lot of small gun safes have wafer-style key locks. These are advertised to allow backup access to the safe. However, the locks also add another way to break into the safe. Jamming something into a wafer lock, and wiggling it while twisting, will open many of these locks. A wooden coffee stirrer and even just a piece of tape works on the one below. Dave at Handgun Safe Research has been making lock picking test videos for a variety of handgun safes. You can find ways he defeats more models there. There are dozens more of these “lock picking” and “safe cracking” tutorials online. These days, there’s a chance your children might run across one of these videos. Spoiler Alert: Watching videos breaking into electronic handgun safes gets pretty repetitive. They all have pretty much the same issues. To be fair, there are a few electronic handgun “safes” that can’t be violated by a loud belch. However, they still have the other issues covered below. Do children ever actually break into small gun safes? While not frequently, tragically yes. In one high-profile case, an officer’s toddler and/or his babysitter somehow got into his police-department-issued handgun safe. The results were tragic. I previously included links to that news video here, but it has been taken down by the news station. I considered including another instance, but thought better of it. Rather than bring any more attention on a suffering family who has already experienced a terrible loss, I’ll continue, in the interest of preventing a future tragedy. Even if a model can’t be opened by a paper clip (a very low bar for a “safe”), these “locks” are also unreliable compared to a real safe lock or the pistol inside. Unrated electronic handgun safe “locks” use inexpensive electronics and assembly technology that you find on “disposable” consumer gadgets. By this I mean today’s average battery-powered device that works for a few months/years before it gets flaky or fails. I design and repair electronics at home and work. Many new household electronic items are apart on my bench within a year or two. A German study found the same thing, including an 85% increase between 2004 and 2013 in large household appliances that needed to be replaced within the first 5 years. In the few years I’ve been in this house, both fridges died (kitchen and garage), as well as the washing machine, dishwasher, automatic coffee machine, and the 5-year-old “high-efficiency” water heater nearly exploded. By comparison, my parent’s house still has a Kenmore refrigerator in the shed from the 60’s, and a naturally-aspirated natural gas water heater installed when I was in middle school. If you’re interested in more detail, I wrote a summary of reliability differences between commercial and military electronics is included in the biometric safe article. I won’t repeat that information here. Given the poor quality of today’s consumer electronics, I can’t recommend any unit with an unrated electronic lock in good conscience. Especially, given that these products are nearly all designed or sold by firms with zero experience in real safes or security electronics, and someone’s life may be relying on it. Now that we’ve discussed issues with handgun safe locks, what are good ones? Guns should be secured with UL 768 Listed combination locks, robust key locks, or Simplex-style mechanical combination locks. More detail on locks can be found in this article. For handgun safes, Simplex style locks and robust key locks/padlocks are the most cost effective. Simplex locks, first patented in 1960, are mechanical push-button devices with user-changeable combinations. They are the revolvers/pump shotguns of small gun safe combination locks, an easy to open lock that “always goes bang”. No batteries to die or flaky electronics to fail. One drawback of these locks is that they only have one or two thousand possible combinations. Simplex locks are not the best choices if you have unsupervised teenage children who might methodically try to enter every possible combination after school. If children do not have unsupervised access to your small gun safe, or if the handgun safe is empty all day because you’re carrying your pistol, this may not be an issue for you. Most small gun safes are very flimsy, another major issue. Common construction materials are thin stamped sheet metal and plastic. Aside from spot welds, most are not welded. For an attacker who does not care about damaging a handgun safe, the majority can be opened with a kick or stomp. The rest will pop open by ripping and bending the lid open with a screwdriver, or just fingers. If these units called themselves “handgun boxes” it would be less objectionable. A “safe” should not break open if you turn it on it’s side and stomp on it. Many handgun safes sold today are actually weaker than old fashioned cash boxes used to sell hot dogs at high school football games, or for office petty cash. The models recommended below utilize thicker steel and most are fully welded. A couple of them could be used as jack stands to work on your car (of course “don’t try this at home”). Some small gun safes claim that they have some fire protection. Don’t waste your time with them. Several manufactures make small true fire safes. Small fire safes have several limitations for use as fireproof handgun safes. Depending on interior size, it takes several inches of fireproofing (usually a concrete mixture) to achieve a true UL fire safe rating. Fire ratings are discussed in detail here. Cube-shaped interiors are more efficient to fireproof than rectangular ones. So, most small fire safe models will be square-ish. As a result, even small fire safes are bulky and often heavy. This makes them harder to fit or conceal close to your bed or other quick-access location. For legal reasons, your self-defense guns should be unmodified and commonly used for self-defense. This makes them replaceable — another reason why a “fireproof” handgun safe is a waste of money. If you do find a small fire safe which works size-wize, you’ll be in the same situation a reader was. The lower price point fire safes will have questionable unrated locks. This is not really an issue for their intended purpose. Small, inexpensive fire safes are intended to secure occasionally-accessed paper valuables like birth certificates. How often do you use your birth certificate? These locks are not intended for life and death situations, like a self-defense pistol. They’re also not intended to be opened several times a day for your carry pistol. Even with unrated locks, small fire safes still often cost as much as the self-defense pistol you’re trying to protect. This is due to the fire proofing and testing required to achieve a real fire rating. For legal reasons, self-defense lawyers and expert witnesses advise that your defense weapon(s) should be an unmodified, common self-defense gun with factory ammunition. You can read about why in this ACLDN article. These stock guns are, by definition, cheaper and easier to replace than the expensive custom race gun you built for shooting steel. Your trophy guns can be better protected in your full sized gun safe. If you’re looking for a pistol safe for a defense weapon, choose one which doesn’t pretend to offer fire protection. Then put an unmodified gun inside, that you could replace if you had a fire. In a fire, the pistol will be covered by most homeowners insurance minimum firearm deductibles, or your (previously free) NRA member firearm insurance anyway. 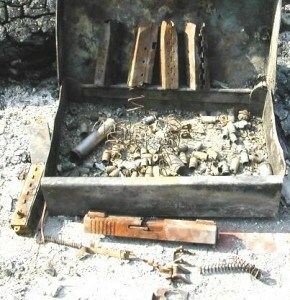 An important consideration for fires and handgun safes is ammunition cooking off. Usually, the main concern with un-chambered ammo cooking off is the damage it will do to guns inside the gun safe. Handgun safes, though, are usually used to store loaded weapons. If a round cooks off “in the pipe”, it could pierce many of the flimsy electronic handgun safes. If you want to store a loaded gun(s) in a handgun safe, it’s best to chose one which could stop the round you intend to leave chambered. Alternatively, keep the gun pointed in a safe direction inside the handgun safe. This article has tips on where to install a small gun safes. Most handgun safes are used for quick-access self defense weapons. That means they hold less expensive weapons than full-size gun safes. Since price is a limiting factor, you want a handgun safe where all of the money is spent on security, not bells and whistles. As the old Navy expression goes, K.I.S.S. (“keep it simple, stupid”). For small gun safes, focus on security and reliability, instead of electronics. Unless your budget will accommodate a UL-rated electronic safe lock, a key-actuated or knob-actuated deadbolt lock is your best bet for security and reliability. Here are three categories for quick-access handgun safes depending on your budget. If you have clever children and a limited budget, get a robust pistol lock box with a good key lock, or go with a creative solution. Some of the creative solutions include getting a large toolbox or locker. If you’re handy, build a closet gun safe, hidden gun safe, or locked hiding spot. Over 100 low- or no-cost ideas can be found in this article. These options will keep your guns and your children safer than the flimsy electronic handgun safes shown above. And, many of them will save you money. Your state laws may restrict some of your options. Simplex handgun safes are great options if your situation doesn’t include unsupervised children who might methodically attempt every possible combination. A robust American-made pistol safe with a Simplex-type lock is great for a home defense weapon for many gun owners. They’re perfect for vehicles and businesses, where unsupervised children are not a concern. When I started this site, the Fort Knox personal pistol boxes and FAS1 were the only heavy-walled handgun safes with simplex locks. The success of these units has caught the eye of competitors. Now you have several options. Note: I have deliberately not included pictures of any locking mechanisms on this site for security. These units open on the “top” like a clamshell, or shoebox. This is the most popular configuration. While top-opening lids provides easy access to the interior, it make installation up high more difficult for those with children. Let’s look at this unit first, since it’s the original top-opening unit, and is also the best-priced for the money. 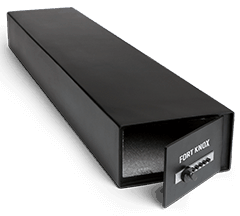 Fort Knox manufactures a solid line of handgun safes, which are made in the USA. All of their small gun safes have 3/16″ (0.1875″) steel doors and 10 gauge (0.1345″) steel bodies. This is thicker steel than you’ll find in the majority of full-sized gun safes! If you pick one of these up and compare it electronic handgun safes, you will instantly feel the difference. There’s no stomping these units open. 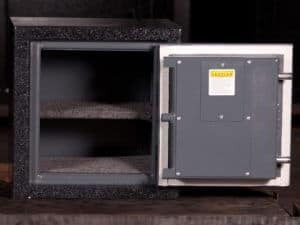 The safes come with four pre-drilled mounting holes on the bottom side, interior waffle foam on the interior of the bottom and lid, and a Lifetime Warranty. A reliable Simplex-style lock is employed. There have been some complaints about looseness of the buttons (reader comment and my response) on Ft. Knox units. This does not seem to have any negative effect on reliability, though it might sway someone towards competing models below. Note that the PB1’s buttons are vertical, so the buttons are retracted by gravity. The loose button complaint is mostly directed towards the side-door models with horizontal buttons. The only holes in the body are the mounting holes are on the bottom of the gun safe. That’s the side you’ll bolt down so that a thief can’t just pick it up and take the safe. Even if the holes weren’t blocked by being bolted down, poking inside won’t open these units like electronic units above. To change the lock combination, the correct combination must first be entered before pushing the reset button. So, even if someone could access the combination reset button, they could not use it to open the lock. For additional security, the combination reset button is protected by a steel tab anyway, making it harder to access. The lock actuates a deadbolt mechanism instead of a spring-loaded plunger. This prevents the type of bump attacks shown in the videos above. 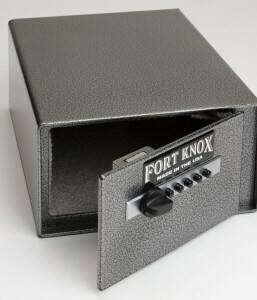 The Fort Knox Original Pistol Box FTK-PB PB1 Handgun Safe measures 12.5 x 10.2 x 4.5 inches. Due to the thick steel it weighs in at 22 lbs. For one-handed operation in a self-defense situation, the heavy 3/16″ thick steel door has a gas strut installed. The interior of the pistol box is padded. You can see it in person at your Fort Knox dealer. Online, Amazon.com carries it and has more reviews, as does GunSafes.com. 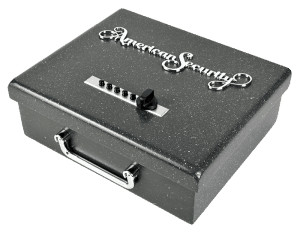 American Security or AMSEC is the only company making handgun safes that actually makes true UL-rated security and fire safes. They apparently saw the popularity of the Fort Knox Original Pistol Box and wanted in on the action. 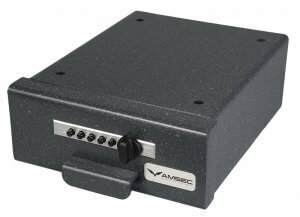 AMSEC’s PS1210HD (“Heavy Duty”) has almost the exact same specifications as the FTK-PB. Note that models without the HD suffix do not have heavy-wall specifications. Like the FTK-PB, The PS1210HD is made in the USA with a 3/16″ (0.1875″) steel door and 10 gauge (0.1345″) steel body. Both have simplex locks and gas struts on the lid. The PS1210HD has a handle which the FTK-PB does not. Given that handgun safes need to be bolted down for security, and this unit is a bit heavy for portability purposes, the handle isn’t the most useful addition. If you really need a handle, the lighter PS1210EZ may be a better fit. The PS1210HD has “pick-and-pluck” foam inside. The FTK-PB is clam-shell waffle foam inside. Given that I also store holsters, flashlights, extra magazines, and ammo inside my handgun safes, the pick-and-pluck foam isn’t a big benefit. But it can always be “plucked” out. The PS1210HD is basically the same size as the FTK-PB, only 1/4″ shorter in height at 12.5″ x 10.25″ x 4.25″. Despite the slightly smaller dimensions, the PS1210HD weighs more at 24 lbs vs 22 lbs for the FTK-PB. The 9% increase in weight indicates more steel (and a handle). Given AMSEC’s experience with building true safes and the weight difference, it’s safe to say the PS1210HD is somewhat stronger than the FTK-PB. Note that the strength difference between these two is negligible in comparison to their superiority to most all electronic handgun safes. One significant divergence between the PS1210HD and FTK-PB are the lock options. In typical AMSEC style, AMSEC gives you lots of lock options, with not all of them being great. In addition to the Simplex lock, AMSEC offers 7 other lock options, including two UL 768 listed ones. These will probably be special-order options through a dealer, as I didn’t see these stocked when I checked. Although they have similar specifications, the Simplex version PS1210HD is priced higher than the FTK-PB. The additional money buys you some more steel, a bit more security, a handle, better fit and finish, and a heritage of a company which knows how to build real safes. You can see the PS1210HD at your AMSEC dealer, Amazon has it and more reviews, as does GunSafes.com. The little brother to the PS1210HD is the PS1210EZ. The PS1210EZ is the exact same size at 12.5″ x 10.25″ x 4.25″ as its larger brother. It’s also made in the USA. However, the EZ’s steel is nearly half as thick at 14 gauge (0.0747″). This reduces the weight by over 40% to 14 lbs. The EZ is advertised as portable. In this application, the handle is a benefit, and so is the lighter weight for portable applications. On family vacations I bring a FTK-PN for the rental house. At 20 lbs, plus pistols, holsters, flashlight, and ammo, the FTK-PN doesn’t make for the lightest luggage, and doesn’t have a handle. A lighter model like the PS1210EZ would be better for this application. The paint on the EZ is more utilitarian than it’s big brother the HD. The EZ is listed on AMSEC’s website with the same lock options as the HD. Since the EZ is easier to break into than the HD, and is advertised as portable (and thus easier to steal), the stock Simplex lock is probably the best choice for the EZ. You can see the PS1210EZ at your AMSEC dealer, Amazon, and find it at GunSafes.com. 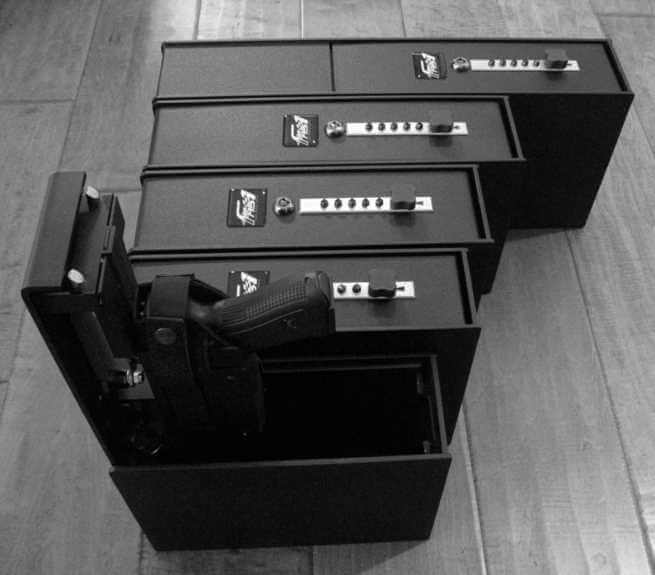 V-Line has been selling the only Simplex under-desk handgun safes for some time (seebelow). They’ve now gotten in on the top-opening market. These units are made in the USA. The BRUTE is made completely of 10 gauge (0.1345″) steel, so doesn’t employ 3/16″ (0.1875″) steel in door like the Fort Knox’s and PS1210HD. On the BRUTE, the front cover overlaps more of the sides, perhaps to compensate for the thinner steel. The BRUTE also has a Simplex lock and gas strut for the lid. It has a foam floor and waffle-foam lined-lid. It is slightly smaller than the other two models at 12.5″ x 9.5″ x 3.6″, but weighs almost much as the FTK-PB at a little under 22 lbs. GunSafes.com has a pry/abuse video of the BRUTE, and Amazon carries it. The side-opening door is the most flexible configuration in my opinion, although it is not as popular as the top-opening models. Side-opening doors allow handgun safes to easily be bolted down up high, out of the reach of young children. These can also still be bolted vertically (top-loading) with the door at the top. One consideration of side-opening handgun safes is reaching inside. In a stressful situation, you could grab the trigger retrieving a pistol. If you want to store handguns inside “Condition 0”, it’s worth thinking about when deciding between top-opening and side-opening. Personally, I only store loaded guns in holsters in side-opening handgun safes. 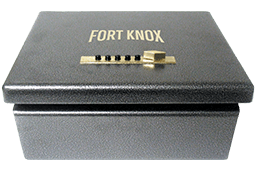 Fort Knox’s bigger side-opening model is the Personal Pistol Box FTK-PN Handgun Safe. It is narrower and taller than the Original Pistol Box at 9.5 x 5 x 12.5 inches. It uses the same steel thickness as the FTK-PB at 3/16″ (0.1875″) door and 10 gauge (0.1345″) body. The thickest part of the safe, the door, is on a smaller side of the safe than the FTK-PB. This makes these units lighter, weighting in at just under 20 lbs. Like the others, it’s also American-made. Most models use Kaba Mas brand locks with round buttons, including one of mine (all bought retail in case you’re wondering). Another of my FTK-PN’s has a lock made by the Illinois Lock Company with square/diamond buttons. There have been some complaints about looseness of the buttons (reader comment with my response). This does not seem to have any negative effect on reliability. The door on this model has spring-assisted hinges for one-handed operation. When mounted horizontally, the springs swing the door open on its own as soon as the deadbolt clears. If you want to mount this model vertically (top-loading), on their own the springs do not have the strength to flip the door up and open. At that point it only takes the help of a light tug on the knob to flip the door open when mounted vertically. The interior is carpeted and open. I prefer this configuration, as it doesn’t waste interior space with foam. Carry guns can be left in the holsters and stacked inside. See the Personal Pistol Box in person at your Fort Knox dealer. You can also read more reviews on Amazon.com, and it’s available from GunSafes.com as well. The smaller side-opener is the Fort Knox PB5 Auto Pistol Box FTK-AUTO. It’s advertised for easier installation in a car, truck, or SUV. There’s no reason it can’t also work for home applications, except that gun safes fill up fast so you usually need all the room you can get. The FTK-AUTO PB5 is essentially a shorter, “sawed-in-half” version of the FTK-PN (6.5″ vs 12″). Exterior size is 9.5 x 5 x 6.5 inches. The FTK-AUTO has the same steel thicknesses as its bigger brothers, weighing in around 12 lbs. It’s made in the USA. The interior is carpeted and open like it’s big brother. It’s smaller size and weight make the FTK-AUTO more portable. Although it’s 2 lbs lighter than the PS1210EZ, it doesn’t have a handle. For portability, the PS1210EZ is probably a better general option. But the dimensions and interior height of the FTK-AUTO may work better for the spot you have picked out. If you want to test fit one in your car/truck, check a Fort Knox dealer. Online you can pick one up at Amazon.com, and also GunSafes. Fort Knox also has a unit for shotgun or rifle, the PB6 Shotgun Safe. The PB6 is one of the few fully-enclosed quick-access Simplex shotgun safes. Even though it’s much larger than the pistol boxes, Fort Knox didn’t use thinner steel. It has the same 3/16″ thick steel in the door and 10 gauge steel in the body. The safe is 9 x 5 x 45 inches and tips the scales at 36 lbs. Check a Fort Knox dealer if they carry it. Online, GunSafes.com stocks it. It’s also sometimes available at Amazon. I stopped trying to link to it from there because it kept selling out. Holster-type handgun safes include integral holsters to secure the weapon inside. The holster may be secured to the door itself, or a mechanism. When the door is open, the weapon is presented to you by the grip so that it’s easy to grab. The drawback of internal holster handgun safes is that it’s meant to store one gun only, without other accessories. It’s a good fit for quick access weapons in car or truck consoles, bedroom built-ins, and attaching to bedside furniture. One of the oldest products on this list is the FAS1 (Fast-Action Safe), sold since 2009. In addition to the original polymer handgun unit, models have been added over the years to support large revolvers, handguns with lights, a shotgun pistol (Serbu Super-Shorty), and even handguns with suppressors. The holster is attached to the door, which is opened with a gas strut. The gas strut is strong enough to open the door in any position, though this may mean a short delay while the strut operates, depending on orientation and pistol weight. The door and all sides of the FAS1 is 3/16″ (0.1875″), making it heavier-walled than the Fort Knox and AMSEC HD models. In fact, the FAS1 is the heaviest-walled Simplex handgun safe on this list. The FAS1 door mechanism uses dual rod-type latches. You’re not going to be able to bump them open, but it isn’t a deadbolts. Unlike the deadbolts, turning the knob to lock the door is unnecessary, you just close it. With the key lock left in the middle position, the Simplex pushbutton lock functions normally. If the key lock is left in the “Out” position, the key lock prevents the combination lock alone from opening the door. Basically the locks will function in series, where the combination lock AND the key lock must both be operated to open the door. Until the key lock is turned back to the middle, the combination lock knob will spin freely. You must also remember to turn the key lock back to the clockwise position to reactivate it. If you turn the key lock “In”, the key alone will open the door. This is parallel-lock (“backup lock”) operation where the pushbutton OR key lock can be used to open the door. If you don’t want this feature enabled, the FAS1 comes with a lock-stop washer to prevent turning the key cylinder to this position. For simplicity, I prefer Simplex handgun safes without key locks, but if I was going to get a supplemental key lock I would install the lock-stop washer. For security, the FAS1 is the only model on this list which comes with no mounting holes. You will have to drill your own. FAS1 safes are proudly made in San Antonio, Texas by a small business. You can find more videos and order them from their website. Titan offers a Simplex handgun safe with a lever-actuated holster inside. When you open the cover, the weight of the door lifts the holster to present the grip. The Titan Gun Vault is California DOJ Approved. While not as robust as the heavy-wall units listed above, the Titan is one of the thinnest Simplex units available. This is enabled by its integral holster design which doesn’t require extra room to reach inside. The unit without ammo box measures 8″ L x 2.75″ W x 12.5″ D and weighs 10 lbs. Titan’s handgun safe has an innovative provision for storing ammunition separately if your state laws required it. They also sell a piggyback ammo box compartment to lock your magazine or speed loader. Opening the door unlocks both the gun and the ammo at the same time, presenting them for loading. Adding the ammo box increases the length to 10.5″ L x 2.75″ W x 12.5″ D.
These units are similar to the side-opening units above, with two differences. First, instead of a door, they have sliding trays to present the contents to you so you don’t have to reach inside blindly, under the desk. Also, these units are made to be bolted at the top rather than the bottom. These are an obvious choice for the office. This could also come in handy for bolting to the underside of workbenches, tables, or below-eye-level closet shelves. Below eye-level is important to allow you to see down into the slide-out tray so you can avoid the trigger as you grab it. For shelves at or above eye-level, you could instead get a side-opening model and bolt it upside-down. 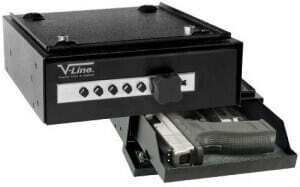 For years, the V-Line Desk Mate below was the only option for under-desk handgun safes. 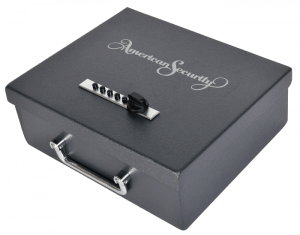 AMSEC’s foray into handgun safes has added another option. Exterior dimensions are 12″ x 10″ x 4″. The HAS410 uses 7 gauge (0.1793″) steel in the door and 10 gauge (0.1345″) steel in the body, putting it in the same heavy-wall class as the PS1210HD and Fort Knox units. It tips the scale at 20 lbs. You can check your AMSEC dealer for the HAS410, Amazon carries it and has more reviews, and you can find it at GunSafes.com. Two long-running V-Line models are designed to be mounted to the underside of your desk. The Desk Mate is designed for one pistol. The Hide Away is bigger and could fit a couple pistols. If you want to secure a shotgun for home defense, you don’t have to enclose the entire gun. Another option is to secure the trigger assembly and receiver with the ShotLock Shotgun Solo-Vault. It’s also a California DOJ Approved Firearms Safety Device. 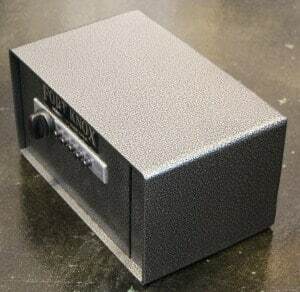 If the models above don’t work for you, the absolute best small gun safe for home will really be a wall safe or jewelry/home safe with a UL 768 Group I or II electronic keypad lock. 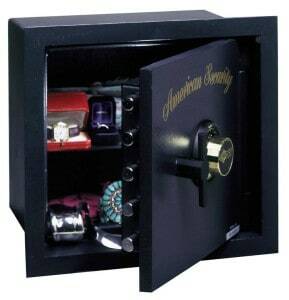 These safes start in the hundreds of dollars, as the locks alone are $80 or more. You can also find used jewelry safes cheaper. Home defense pistols are small, so you have a lot of flexibility as to what size used safe you can pick up. An electronic keypad makes access fast for your home defense weapon. UL 768 locks have the security of more possible combinations than a Simplex-style lock. You could also use them to keep your medications away from your children, but conveniently in your bedroom. A wall safe is easy to hide behind a hinged picture or mirror. A home safe can be bolted to the floor, or built into a wall, built-in, or piece of furniture. Because small safes are so portable, it’s even more important that you anchor them. For example, this burglar stole a jewelry safe from an apartment using the victim’s desk chair. 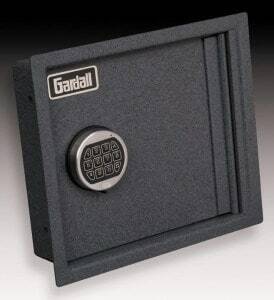 Wall safes like the Gardall SL4000 have thinner steel than a B-Rate true safe, but are much more secure than any of the electronic handgun safes above. Sturdy Safe recently entered the small gun safe market with their “The Cube” Pistol Safe model 2020. These units have exterior dimensions of 24″ x 19″ x 20″. In typical Sturdy fashion, they’re available with or without Sturdy’s style of fireproofing, which is lighter than traditional fire-safe insulation. Interior dimensions change depending on fireproofing and steel thickness. Sturdy Cube 2020 pistol safes are available with different steel thicknesses, starting at 3/16″ body and 5/16″ door. The thickest steel currently offered is 4 gauge body (.2242″) and 3/8″ door. These models come standard with UL 768 Group II S&G mechanical dial locks. Other lock options are available as well, including dual locks and electronic keypads. Prices start at $790 without fireproofing or $990 with fireproofing. Sturdy takes a unique approach to gun safes and fire protection. Their products emphasize security much more than cosmetic appearance, giving you a lot of bang for the buck. The Cube 2020 is constructed similarly to their full-size gun safes. For more information on Sturdy and their construction, see the detailed full-size Sturdy vs. AMSEC BF gun safe review. If you’re interested in security for valuables, a burglary rating of B-Rate or better is preferred. Compared to a gun safe, a true safe is a much better place to store other precious items like the missus’s jewelry. It could also get you a discount on your homeowners insurance. The AMSEC WS1214 wall safe has B-Rate construction and is also available with a proper UL 768 electronic lock. 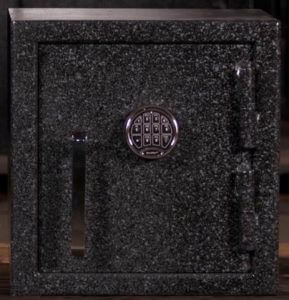 If you’re looking for a bigger general purpose safe with both burglary and fire protection, a little brother of one of the Best Gun Safes should be on your list to check out. The BF true safes (BF1512, BF1716, BF2116, BF3416) have both B-Rate construction and a UL 72 Class 350 1 Hour Fire Endurance Rating. If you want to protect your expensive DSLR digital camera and family photos from fire, get one with an appropriate Class of UL 72 rating. More recommendations: Best Gun Safe and Biometric Gun Safes. Thankfulness to my father who informed me about this webpage, this blog is actually amazing. I’m surprised that you recommend/endorse safes with Simplex locks. A quick web search shows they have significant limitations and security concerns. At the very least, a lock with only 1,081 combinations could likely be defeated in less in 90 minutes by simply trying one combination every 10 seconds (and I think that’s a very conservative estimate). A curious child could easily achieve that in one afternoon. I’d be very interested to hear your thoughts on this topic. Thanks for reading, and your great comment. You’re reinforcing a very important point. More information about defending against methodical combination attempt attacks can be found in Number of Possible Combinations. Some suggestions are also given there to increase the security of a Simplex combination. Mounting a small gun safe 5 feet off the ground, as discussed in Guidelines for Installing Small Gun Safes, is an important precaution to limit access to children. Unfortunately Simplex locks generally only have one or two thousand possible combinations. Because of this, they’re not the best choices if you have unsupervised teenage children who might methodically try to enter every possible combination every day after school. If you do have children who might try to defeat the combination lock this way, you’re better off with suggestions in these two sections: 1) Best Pistol Safe for clever children and a limited budget and 3) Best Small Gun Safe for Home. Note that a key locking handgun safe (section 1) can be even more vulnerable to the kids finding your main or spare key. Ideally we’d all keep our self-defense firearms behind UL 768 Group I or II locks. Indeed, a quick-access bedroom wall safe is an easier sell to a spouse who wants to protect jewelry and/or other small valuables. The reality though is that not everyone needs or can afford that level of protection for both a full-sized gun safe, and a quick-access bedroom handgun safe. Due to their cost, simplicity, and reliability, Simplex style small gun safes are very popular. In many environments, like gun safes used in businesses and offices, there are no children to worry about. In cars and trucks the doors, bed, and/or toolboxes are usually locked anyway whenever the owner is not with the vehicle. Home circumstances vary widely from gun owners with no children, to those with limited custody or occasionally visiting grandchildren, to homeschooling parents who give constant supervision. Parents with mischievous unsupervised teenagers are probably better off finding another type of lock. On the other hand parents with either very young or adult children, or whose kids have moved out, have lower risks. Many who carry concealed use Simplex safes to store their carry guns when they get home; these safes are empty any time the parent is away from the house. 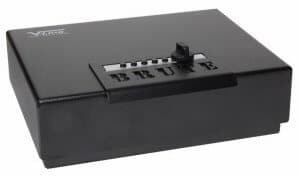 Some owners employ supplemental means of controlling access to these safes, for example keeping a Simplex gun safe in a locked bedroom, closet, or drawer. Others use Simplex gun safes to store only ammunition or loaded magazines separately from firearms. Every situation is different, and no one knows a child better than his or her parents. A little more than a generation ago, most guns were stored in the back of a closet or on a high shelf. Today, many states have laws requiring firearms to be securely locked for storage, and some dictate specifically which devices can be used. Gun owners alone are responsible for the security and safety of their firearms. So, ultimately it’s up to the gun owner to determine what protection is called for in his/her own situation. Have you ever tried doing that max combo try? Boredom sets in fast for kids and teens. Plus most forgot the pattern they were using and had to start over. Plus using a multi button single push discourages easy random opening. Your theory losses weight when practical time sets in. No burglar wants to sit around picking at safe numbers, they smash and grab. Absolutely. No burglar is going to fuss with typing in codes. The main concern with the number of combinations is clever, patient children. The math required for figuring out the combinations isn’t rocket science, but it is tedious, especially for multiple-button-push codes. Thanks for your quick reply. I missed those details you had already provided (a tribute to how much information you have here). It’s a good point that security has to be matched to the expected threat. it seems like a deal breaker to me that the Fort Knox safe doesn’t come with a key to override WHEN, not if, you forget the combination. I’m looking to get my son a quality small gun safe that he could mount under his bed. I’m sure he’d like to have easy access in the event of an emergency too. Hi Janet, thanks for reading. Take a look at the small gun safe recommendations section. Many of the units shown in the 2) Best Quick-Access Gun Safe for the Money section with side-opening doors would be a good for under a bed. The clam-shell door model (FTK-PB) is not the best choice for under a bed, because access would be difficult once bolted down. For under a bed, I would go with the biggest one that fits, especially if he carries concealed. Many who carry concealed leave their pistol in the holster when putting it away in a bedroom handgun safe. Another reason is that for home defense, it’s good to store a flashlight and other necessities in there as well. Good articles and comments on this site. One thing I haven’t seen covered is the issue of moisture accumulation. This is a big problem on my larger SentrySafe. So much so that I can’t use it for weapons, even if I wanted to. Do any of those mentioned exhibit the same characteristics as mine??? Hi Dale, As you pointed out, moisture can be a big problem in gun safes. For reference, here is the section on dehumidifiers and desiccants. For the most part, gun safe moisture is more related to the air and humidity outside the gun safe than the gun safe itself. The exceptions to this are gun safe door seals and fire insulation. Door seals can help make the dehumidifier or desiccant more effective by slowing down the entrance of humid air from outside the gun safe. Regarding insulation, most types of gun safe fire insulation materials can hold a serious amount of moisture. The moisture is one reason why the fire lining offers protection against fire, but that moisture is held on the inside of the gun safe where your guns are. True safes usually protect the contents of the safe from the fire insulation moisture with a welded steel inner fire liner. Most gun safes do not. Incidentally, one advantage of Sturdy’s atypical fiberglass fire insulation is that it doesn’t use moisture to protect from fire, and so doesn’t retain as much moisture either. None of the small gun safes that I know of come with door seals, dehumidifiers, or desiccants. A couple small gun safes pretend to offer fire protection. However these claims are pretty bogus. For you, the attempt at fire insulation could make your moisture problem worse. — Use the small gun safe for only stainless steel weapons. Most carry guns are stainless to prevent moisture issues. Close body contact over time can cause corrosion and unreliability. — Locate the small gun safe in a less humid room in your house with a more stable temperature. The location of a handgun safe is very important for self-defense, but make the best use of what you’ve got. — Put your gun in a moisture-resistant case, inside the small gun safe. The traditional option is a fleece-lined suede hangun case. More modern options are a silicon-impregnated sock like a BoreStore. — Use a dehumidifier or window air-conditioner in that room during humid months. Small air conditioners can be picked up in classifieds or even new for less than a decent handgun safe. To save on your electric bill, dehumidifiers with humidity sensors or air conditioners with thermostats can be useful. You could also run the air conditioner only during the most humid times of the day to save money. — Use a partially-enclosed style like the ShotLock. — Improvise a door seal on your small gun safe with some foam rubber gasket material. Then add a small dehumidifier or desiccant. Due to the small area, a desiccant may be more effective than a dehumidifier, but will require periodic maintenance to bake out the moisture. Make sure the gasket doesn’t put pressure against the door lock mechanism, which could cause it to fail prematurely. — Build a hidden gun safe out of a piece of existing furniture that doesn’t have a humidity problem. With that said, if you have a moisture problem in a small un-insulated metal box like a hangun safe, your gun may rust almost as fast out in the open. You might first want to be sure your strategy for dealing with moisture will work before laying out the cash for a small gun safe. For example, you could do a test out a desiccant or suede case inside an old metal lunch box before committing money to a handgun safe you can’t use because of moisture. Thanks for the informative and well written article. I was looking at the AMSEC Defense Vault for under the bed. It has what they call, a ESL5 electronic lock. Any idea if this is a reliable lock in your opinion? Thanks! The buttons on the Fort Knox’s simplex mechanism are over drilled and the buttons tend to unevenly stick out loosely. Go with Amsec PS1210HD or V-Line Top Draw. Thanks for bringing this to everyone’s attention. I have two of the very same model and took a look. One of my units has an Illinois Lock Company lock with square/diamond-pushbuttons. The other has the round-pushbutton Kaba Mas lock which is on his unit. The Kaba Mas (round) are a little bit looser than the Illinois Lock Company (diamond), but both are similar. I haven’t taken mine apart to check but, by pulling on the buttons, they seem to behave similarly to his. With that said, I’m not sure it’s a problem. As an engineer, my starting point is the same as the video’s author — I always start with the manufacturer’s recommendations. However, some manufacturers’ recommendations have been wrong or just didn’t work in my application. Sometimes manufactures update their products and the design guidelines have to change. Fort Knox may have found that looser holes made the pushbuttons less prone to jamming and therefore more reliable. They may have found that tight holes were rubbing off the retaining shoulder and causing the buttons to fall out. Or that differences in paint thicknesses or machining burrs may have bound up buttons. Or, customers may have complained that the tight holes were leaving scratch marks on the buttons, showing the combination. There are also some less positive interpretations. Fort Knox may be trying to keep its options open with big holes that fit locks from different manufacturers in case of shortages. In that case the holes will be a great fit for certain locks and looser for others. Since the Kaba Mas buttons are a little looser than the Illinois Lock Company ones, this may be the case. Demand for these units has exploded as they are very poplar. Production line and vendor changeover hiccups can accompany this type of growth in any industry, and there can be running production design changes. I did notice that the buttons were looser than I expected when mine arrived. Since then it hasn’t bothered me much, as they don’t stick out unless I pull them. After using both hundreds of times, I can say that mine have been totally reliable. I also noticed that the slide of my stock Colt 1911A2 was looser than I expected. Of course, the looseness has made it more reliable in outdoor shoots than my friend’s custom gun with its very tight slide. I can’t say that I don’t wish my 1911A2’s slide was tighter, but it’s loose for a reason. I bought my handgun safe for reliability, so I’ll get rid of it the moment I have a problem. If anyone has an issue with one of these Fort Knox units caused by loose buttons, please let us know. If you’re shopping around and prefer tighter buttons, take a look at the other models like those recommended by kjsharks. Great comment. Hi Barry, Thanks for reading. As you mentioned, a Simplex lock isn’t appropriate for all situations. For those looking for higher security locks, the Gardall and AMSEC models were examples given which have real UL 768 rated locks. It looks like First Alert is being ambiguous about the UL Rating. So, something on the safe is UL Listed, and we have to figure it out. A sister model is described on First Alert’s website, “This .94 cubic foot First Alert fire safe is UL classified for 1 hour to withstand an external temperature of 1700 degrees Fahrenheit while maintaining an internal temperature of less than 350 degrees.” Given that they’re advertising the safe carries an actual UL fire rating, that is the basic description of a UL 72 Class 350 1 Hour rated Fire Safe. I couldn’t find the UL Listing for this model in the UL directory search, but that’s not uncommon. Judging by its 77 lbs. weight, it probably has poured concrete amalgamate fire insulation. So, the model appears to be a UL 72 Class 350 true Fire Safe. This brings us to the lock. The first clue is that it has a key override, which no models I’m aware of from recommended brands have. Adding a key override effectively reduces the security of the electronic lock, a major reason why true safes don’t have key overrides. (Some UL 768 combination dials have keys that lock the dial from turning, but a key alone can not open the safe.) Such a key override lock would need both a UL 768 (electronic lock) and UL 437 (key lock) listing to be fully UL certified, and would still be less secure than either one types separately. Given that the 2087DF’s key override is an inexpensive tubular lock type, it’s not going to be UL 437 Listed. So, the First Alert 2087DF model you’re looking at has very respectable fire protection. In fact, its fire protection is better than virtually all gun safes. However, it has an unlisted electronic keypad combination lock with a tubular override lock similar to those on inexpensive lock boxes. From a utility perspective, it is made for fire protection of valuables that you occasionally need access to. For example, paper certificates like stocks and bonds, passports, deeds, etc. to match the Class 350 design. For a quick access handgun safe, the opposite characteristics are preferable. You generally want very reliable locks with little or no fire protection. If you expect to be using the safe on a daily basis, for example for your carry gun, the lock may bite you with a failure sooner than you expect. Because the lock is custom to First Alert, it may or not be easily serviceable and replaced by a safe technician, let alone with parts “on his/her truck”. On the other hand, you may need a fire safe anyway and are looking to make the most of your budget. In that case, putting a couple occasionally used handguns in a fire safe to keep them away from your kids is an option. Keep in mind though that this safe is only as secure as the key lock, making it basically a lock box. Be mindful of where the keys are at all times. Also consider if an inexpensive tubular lock is really enough of a security upgrade from a Simplex lock for your situation. Analogous to computer security, I’d challenge some of your negative aspects of compact biometric safes. First, absolutely for families where children may have opportunities to find/play with/attack any storage type, security must be #1 priority. However, the paradox for anyone considering any firearm for home defense must be the trade-off of security 99.9999% of the time, against the rare moment when immediate access must be available. Fumbling in the dark and correctly entering a combo into the keypad under duress, as precious seconds tick by, hardly seems in line with the entire premise, i.e. having a handgun for protection. One might already have maced an intruder, broken his knee with a bat, and begun ushering one’s family out a designated emergency retreat path while the hapless gun owner has only attracted attention while noisily fumbling to open the damn secure safe. A sober assessment must be made to consider whether (gasp!) you live in an area where any of these risk trade-offs are even appropriate, or a total waste of time and worry. But once you make that leap, deciding you really can justify a lethal weapon in your home, perhaps it only makes sense if it is loaded, chambered, and instantly accessible if needed, at which point a biometric safe or no safe at all may be your only realistic choices. Please advise I am looking for a safe that will hold 5 handguns and would prefer the gun cases would fit in the safe. The size I need is about the size of a small UHaul box. Please share a link that I can purchase a safe without breaking the bank. My handguns are an investment however I spent about $4000 for all of them combined. Looking for a safe under $500. Any recommendations for vehicular options? 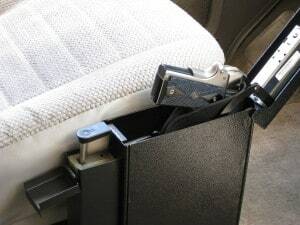 I need something to store a pistol in my car for when I go to places where guns are prohibited. Also, it seems like the security cables for car safes are easily cut. Do you have a suggestion for this? Thanks for the well-researched and valuable information. I have a small gun safe with a Simplex lock that failed after using it for 14 years. The knob became a little sloppy for a week or so, instead of tight for turning left (to reset the buttons), and right (to open the door). Now, It just spins in a 360 without effect. Luckily, I removed the contents before the failure, as it is now locked shut. Any thoughts on this? Hi Louie, Glad you emptied it before you had an issue! Your story will help some other readers: If you have any kind of lock issue, it’s always good to leave the door open on a gun safe until you fix it/get it fixed. Sounds like the knob or shaft is stripped. Ideally when the knob started getting sloppy but still opened, it would have been good to take out the lock and fix it or find a replacement. I would try to open it one last time with your combination. When you have to turn the knob, try pushing in/pulling out/pressing the knob sideways at the same time. If that doesn’t work, you can try to rip the knob off and see if you can turn the inside of the lock with a straight screwdriver after entering your combination. After that you’ll have to try some controlled demolition of the lock and then box. Let us know how it turns out! do you know anything about ‘the gun box’ ? Yeah I would also like to know more about “the gun box” accessories aside, just curious how childproof the box is. Great. Really good post about safe. I think the key lock looks too much like a wafer lock to be secure against picking. I am trying to find a good gun safe with reasonably quick access. I don’t have to worry about small children and I like the no-battery reliability and quick-access feature of a mechanical lock like the Simplex, which I have on my current 15-year old pistol safe. I’m looking to get another pistol safe and I am also looking at the Shotlock Handgun Solo-Vault 200M and would really like to know how that 8-button mechanical lock (which supposedly has over 1500 combinations) compares to a Simplex lock in security. Also curious as to the quality of the included key lock… although if it is indeed a cheap-o wafer lock, I can probably just permanently disable it with an injection of epoxy. It appears that when this article was written, the Shotlock Shotgun Solo-Vault pictured, used a 5-button Simplex lock but current descriptions show that it now also comes with either the “200M” 8-button mechanical lock or the “200E” 5-button electronic lock just like the Handgun Solo-Vault. I would also be interested in what you think of the 200E lock. I am trying to find a safe for some of my firearms, and this was super helpful. It’s nice to see extensive reviews, especially to ensure that I get a safe that will be effective for my needs. Fort Knox does seem like a pretty reliable service. Thanks for providing this list to me, as this certainly has helped me narrow down what type I want! Thanks for reading. Personally, I’m not a fan of handgun safe fire protection for the reasons I mentioned above. If that’s what you’re looking for though, I’ve just gone back and tried to clarify the limitations. Your question is similar to Barry K’s comment above. He was looking at a true fire safe in the same size you are (0.87 cubic foot). Fire ratings are discussed in detail in another article on the site. Depending on the interior size, it takes several inches of fireproofing to achieve a true UL fire rating. Square interiors are more efficient to fireproof than long thin ones, so most models will be square-ish. As a result, the size of true fire safes will be limited by the thickness of the fire proofing needed on each side. The most common fire proofing material in fires safes is a concrete mixture, so they will also be heavy. After that, you’ll be in the same situation Barry was. That is, the fire safes you find will have questionable locks at the lowest price point. Fire safes of this class are generally used to secure occasionally accessed paper valuables. They’re not intended for life and death situations, like a self-defense pistol. Due to the fire proofing and testing required, even fire safes with inexpensive unrated locks often cost as much as common self-defense pistols that would go in them. This is part of the reason why I recommend you save the money, focus on security, and let the pistol burn up in a fire. After all, insurance should pay for its replacement. Using a wall safe is a good idea. As a security specialist (I also have a blog https://secretstorages.com/), the main thing that I would add is that you should not rely on just one remedy. If you want to hide your valuable things inside the house – use hidden storage and various types of safes: floor safes, wall safes, diversion safes, etc. Also install additional security systems in the house: door and window locks, alarm systems (wireless motion systems, hidden cameras, barking dog alarms, light alarm, etc). It is virtually impossible to protect yourself from hacking, but you can make it extremely difficult and time-consuming for a burglars to spend a very long time. Could you please comment on the Hornady® RAPid® Safe which is accessed via key RFID wristband, key fob, sticker or programmable keypad. Do you consider this safe to be reliable? Thanks for commenting. That particular model was the subject of a Q&A I posted a couple years back. A disgruntled owner left a comment too. Thank you for taking the time to help a fellow gun owner who has safety and reliability as one’s first priority. What would be a good pistol lock box with a key as you mentioned in section of the budget locks? Excellent information on this site, but there is a very good handgun safe option with a Simplex lock that hasn’t been mentioned (ask Frank Zykan what he uses). Almost all the concerns raised here about this lock option has been addressed by FAS1 Safes. 1) Heaviest construction of all handgun safes. 7GA (3/16″) steel on all sides and door. 2) Exclusive In&Out supplemental lock option deadbolts the Simplex lock when quick access isn’t desired. This lock is a high security lock and not what you typically find on an electronic handgun safe for a back up key. 3) Exclusive In&Out supplemental lock option can also function as a backup key entry. This can easily be disabled by the user if key access isn’t wanted. 4) Gas spring open door automatically and presents your holster handgun (trigger protected) in the exact same place and orientation every time. The gas spring will open and hold the door open no matter what position the safe is mounted. 5) Mount in any orientation and from any side or bottom. You drill the necessary holes for your application. Hopefully you get a chance to review one sometime and can add it to your list of recommended handgun safe options. Just look at the reviews on the website and you will see how satisfied customers have been for the last almost 10 years they have been on the market. Thanks for commenting Glenn. You’re right, your safes should be on here. I’ll be sure to add them when I get a chance. Just saw the update. THANK YOU Jaime for including us in your very comprehensive and well written article.